Hello, hello! 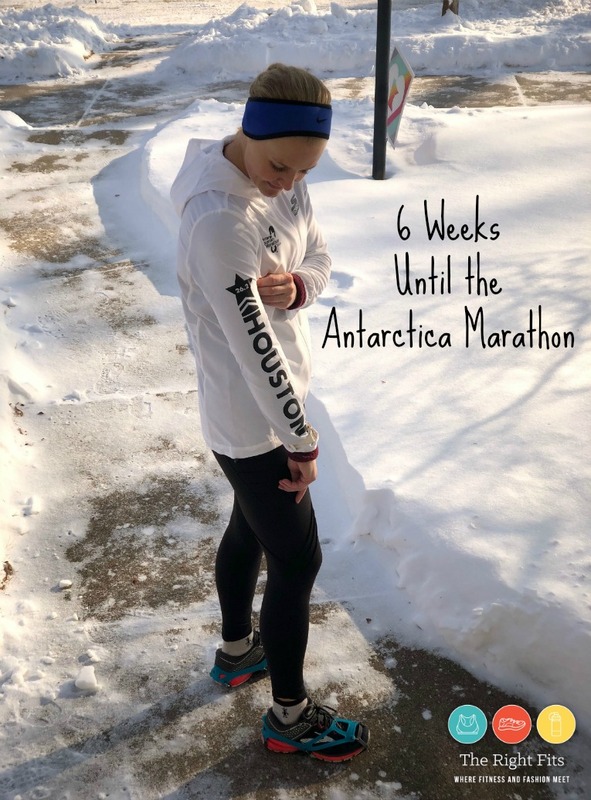 I’m here with my usual weekly recap, this time counting down to the Antarctica Marathon! I have to admit, I am a little superstitious about counting down to Antarctica after what happened last year. (If you’re new here, I was 3 weeks out when I broke my leg and couldn’t go.) It all feels very familiar to be counting down again to the same trip. I really hope I’m not setting myself up for disappointment! 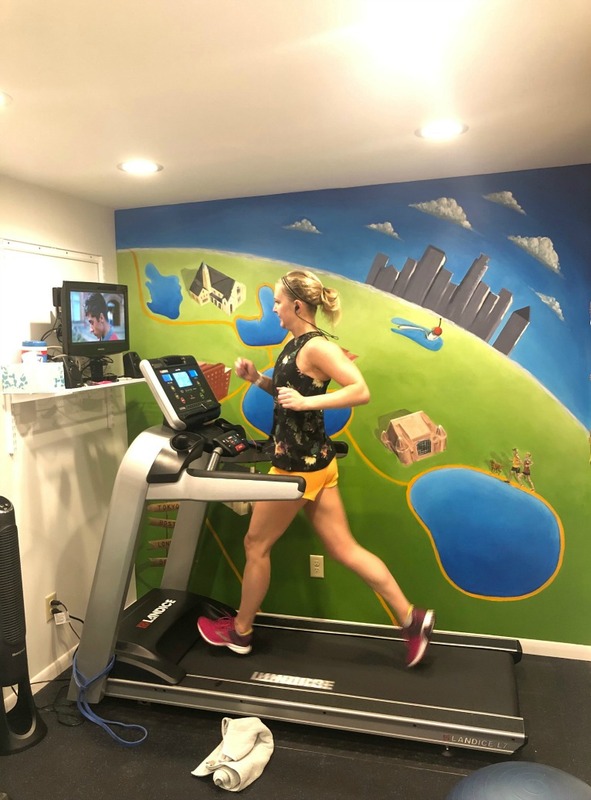 But here goes...I’m two weeks past the Houston Marathon (catch up on that one HERE) and am now building back for another 26.2 (though that marathon will be a beast of its own- more of a trail race, really.) 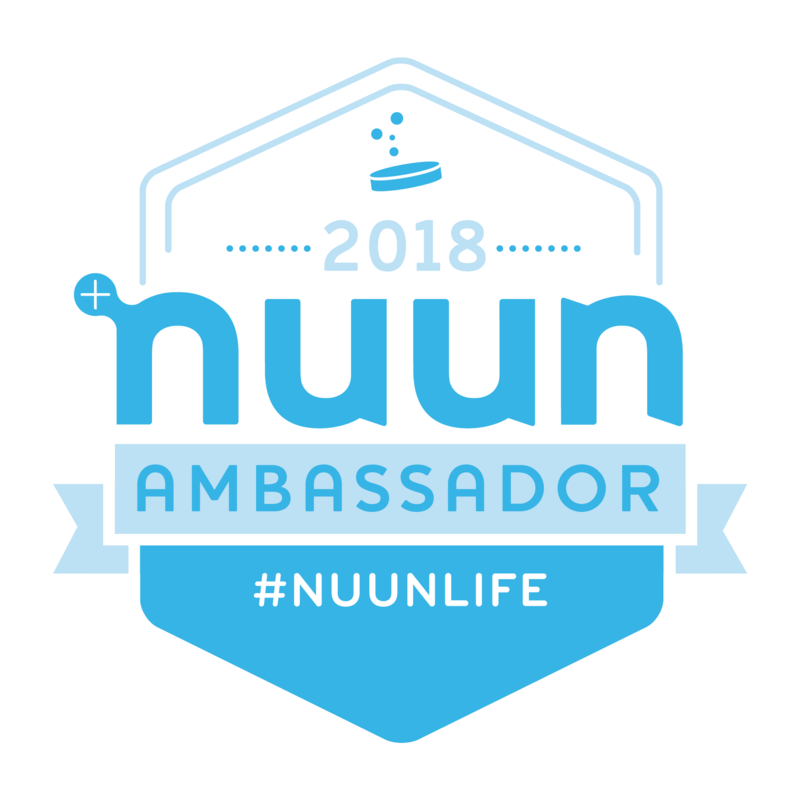 The plan that my coach put together has me doing one 20-miler three weeks out, but not a ton of workouts or mileage; I just need to keep up my distance endurance and STAY HEALTHY. Here’s how this past week of training went! Monday: 4.5 miles on the treadmill before work. The polar vortex hit Minneapolis hard. You probably saw it in the news, and yes, it was miserable. Schools were closed, the post office didn’t deliver mail, several companies closed (not mine…) It was nuts. For me, that meant almost all treadmill miles this week, but it wasn’t too bad since my mileage was still pretty low each day. Tuesday: 4 miles on the treadmill before work, 50 minute HIIT class at ALTR after work. During marathon training, I must be holding back a little in strength classes as I usually don’t get as sore afterwards, but this time I was quite sore, maybe even more sore than after the marathon! Wednesday: 4 miles on the treadmill before work. 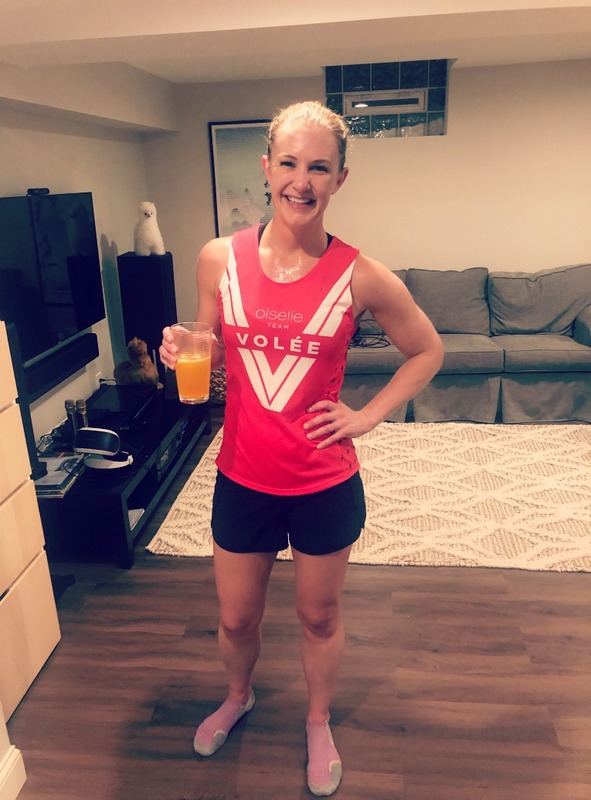 I tested out my new Oiselle Volee singlet. Love it! Thursday: 4 miles on the treadmill before work. Same old story! Friday: 30 minutes on the treadmill before work or 3.5 miles, vinyasa yoga at Corepower after work. The weather finally started to change on Friday; we finally hit a temperature ABOVE zero. What joy! Saturday: 7.25 miles OUTSIDE with my friend Vicki. The trails around the lakes weren’t great- they were still snow-covered, but I wore my kahtoola nano-spikes which helped a lot! 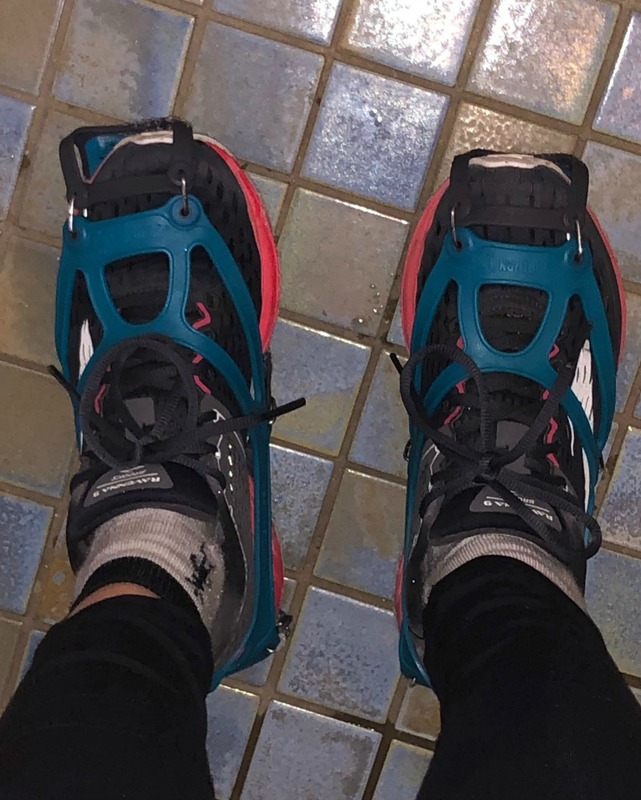 I’ve mentioned the kahtoola spikes before- I like them more than my old Yaktrax, as they aren’t as heavy or as annoying when you do run on clear pavement. I didn’t even notice them on this run! Saturday night, Dustin and I joined a few friends at Young Joni for dinner before heading to the Luminary Loppet for a little while. Such a fun Minnesota event! Sunday: 5 miles on the treadmill. It was warm outside, but all the melt from the previous day had turned to ice, so I chose the safety of my treadmill. 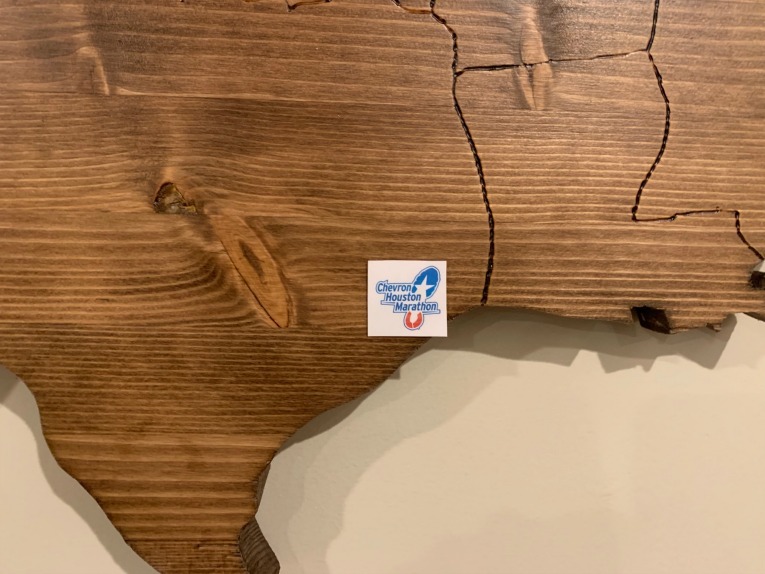 I added a ‘sticker’ to our marathon map to cross off Texas, my 19th state (30th full marathon!) What do you think? Apparently I need to run some marathons in middle America and the deep South! 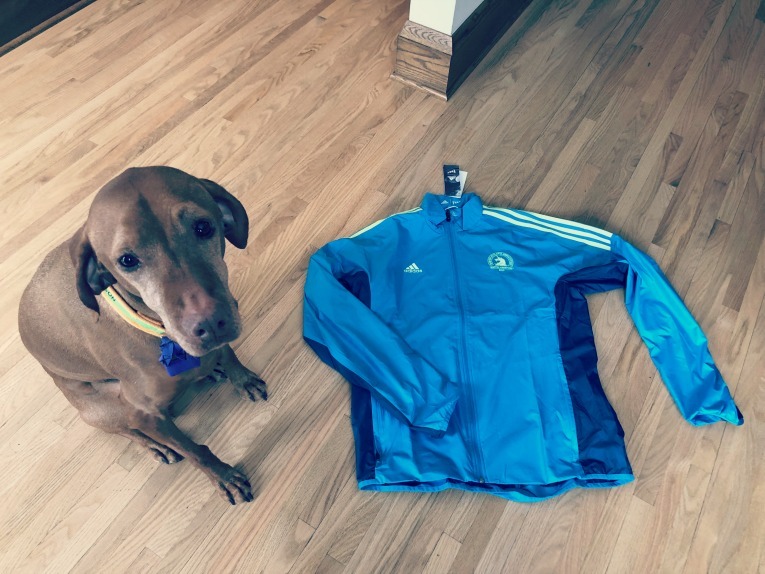 Dustin (my husband) is running Boston this year and ordered the Celebration Jacket, which arrived this week. I kinda wish I was running this year, just because I love the traditional colors of the jacket. Tilda likes it too! That’s it from me this week. 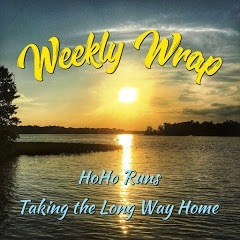 Thanks for reading, and be sure to check out all the other great weekly recaps that are a part of HoHo Runs and Taking the Long Way Home ‘s weekly recap link-up! 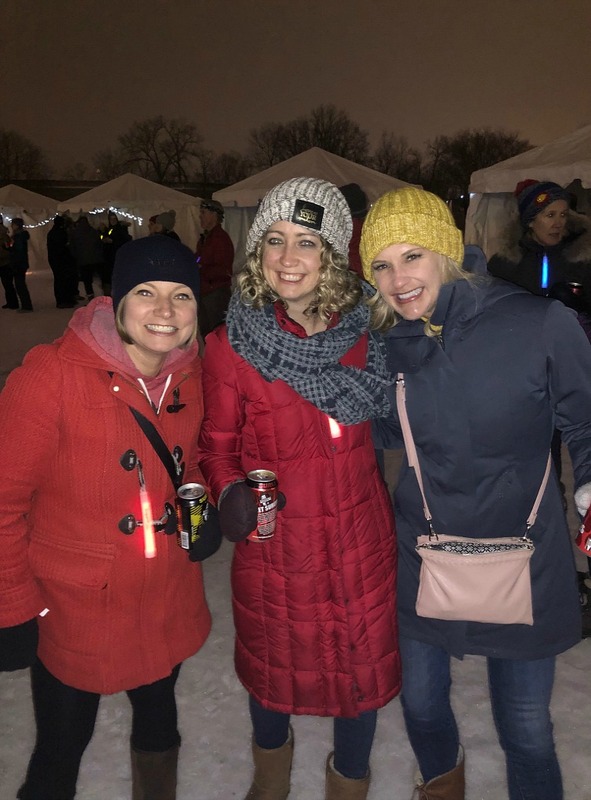 We did the Luminary Loppet for the first time and had a blast. Perfect night for it as well! Reading this with interest as I’m working out what to do between my marathon (26 May) and my ultra (14 July). At the moment I’m thinking 2 light weeks, one 10/8 back to back, one 20/10 back to back then two light weeks then go. Most people in the ultrarunning facebook group I’m in seem to think that’s OK tho there’s always one going RUN MORE MILES. Great pics and hooray nanospikes. Mine are still keeping the snow away from here. The rest of the country is knee deep in it and we have none!! That sounds like a pretty solid plan. I had 1 week totally off, 2-3 building back, 1 twenty miler and then ‘taper’, but I’m not doing an ultra, only 26.2! Thank you, that helps a lot!! It’s only (HA) 31 miles, so not tooooooo different apart from having to do the back to backs to practise running when tired. I am beyond excited for you to run in Antarctica. Heck, it was colder here than at the South Pole, so the temperatures have nothing on you! Haha, true! Thanks Wendy! I really hope I do it this time. I love your zip up jacket that you got from the Houston Marathon. The Boston Marathon Celebration jacket looks great this year! I hope that all the runners have way better weather this year vs. last year. -20 is still pretty darn cold, so kudos to you for surviving! Thanks, it’s my first Sketcher brand apparel item. White is hard to keep clean though, ha! I hope the weather is better at Boston too! I saw elite runner Mike Wardain did the Antarctica marathon for the 7 marathons in 7 days challenge last week. He had shorts on! I guess it might be warm for you! Yay! I hope you like them Sara! Just ran 4 miles in them on Minnehaha Parkway’s packed snow and ice and felt totally secure! Game changer! So much more comfortable than my Yak Trax. Thanks again for sharing! So happy I got these. That polar vortex, holy $hit! So glad you powered through and got the miles done on the treadmill and stayed safe and warm! 6 weeks to go!!!!! Thanks! Let’s hope I made it to the starting line this time! Antarctica just seems so epic! I know you are going to make it this time! What will the conditions be like? It really varies year to year, but it won’t be as bad as the weather in the Midwest this past week! I love that marathon map! My dad has a wooden map of Africa which is for displaying teaspoons that he collects from all over the world. Your map reminded me of that, it;s lovely and such a cool idea! I’m so glad that Antarctica is on the table again! I completely understand why you are tentative in counting down to it, I would feel the same actually – but you’ve got this. You have worked so hard to get to this point. Just focus on staying healthy and getting those runs done. Your dad’s map sounds really cool! My dad used to collect spoons too from trips…I love that idea. I’m definitely just focusing on staying healthy and injury-free this time! I’m excited for you in Antarctica! It’s GOING TO HAPPEN this time around. No broken legs. 🙂 My weeks between Tokyo and London will be similar. I just wanna maintain endurance and cruise into that 6th major. Love your map and the stickers! So fun! I hope you’re right Marcia! I love the map w/your stickers. Need to add Hawaii to your map! You will love the gorgeous weather, mountains, and the ocean here. I also noticed that your wall is a picture of Tilda, Dustin, and you running! Did you paint that wall? It’s so cute! Great job on your run! We actually do have Hawaii and Alaska, separately, we just haven’t hung them up yet. I hope to run Hawaii soon! I didn’t paint the mural, but my talented friend Angela did. I love how it turned out! I can understand the superstitious thing going on!! It was 13 days after Grandma’s Marathon that I found myself on the operating table. Thankfully, my training got me through my NC marathon, and the recovery was (dare I say?) almost a breeze. WHEW! I’m excited to see you crush Antarctica!! Thanks Kimberly, I hope you’re right! 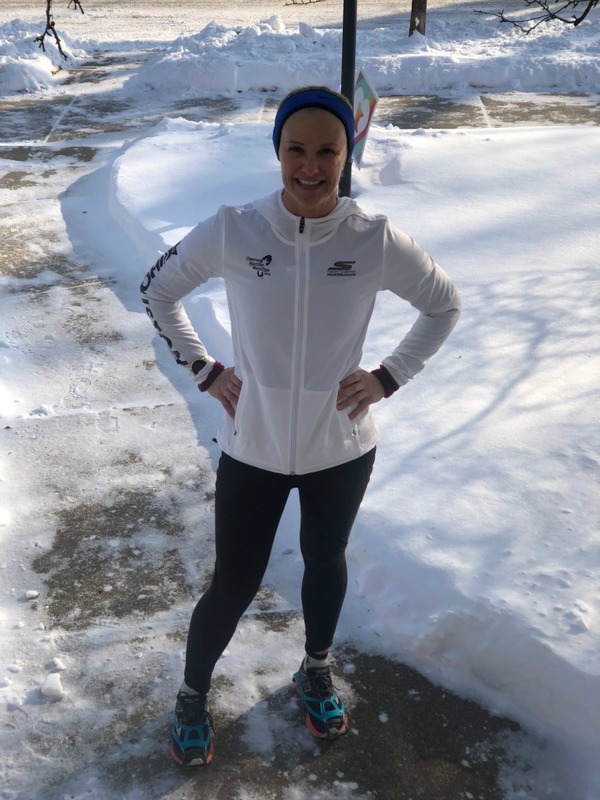 As your fellow Minnesotan, I have to wonder – are you already running in Antarctica with this weather lately?! At least you are properly temperature acclimated 🙂 You are so strong now returning after that last injury! Keep it up and keep training smart. It’s a big year of racing for both you and your hubs! Haha, well, where we actually run the marathon on King George Island, was in the 30’s while Minneapolis was in the -30’s. Insanity! I’m not surprised you feel a little nervous about counting down to Antarctica after your experience last year. It’s only natural, especially given that extreme weather. Well done for keeping your training going through all that disruption. Thanks Allison! I’d rather get to Antarctica a bit unprepared for the winter weather than not get there at all because of a broken leg, so I’m definitely being conservative! Hope all is well in Scotland! Love your marathon map. 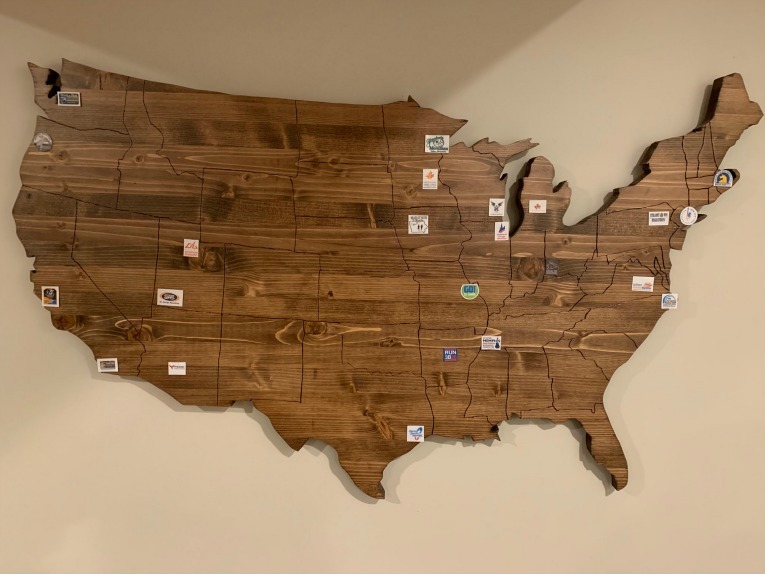 My brother & SIL have a similar for their road trip – their route is carved on it.